Hello Friends! I’m indulging in a lovely daydream today about who would be cast in The Lance Temptation if it were made into a movie. I came across the photo of Madison Pettis on the Nickelodean website, and I thought Aha! There’s Emili! Granted, Emili usually wears her hair straight, but that’s easy to switch out. Emili’s original boyfriend is Marc Rounder, an all-around good guy basketball player. 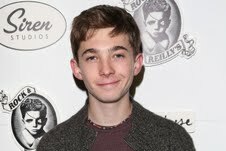 Of course, I had to choose Austin Abrams. He reminds me completely of Marc. Look at those innocent eyes and friendly smile. They scream Marc Rounder. Trouble is Emili grows dissatisfied with her nice guy. She hankers after the hot guy — which throws her head-first into dangerous territory. She flounders her way around with the acid nosiness and help from her new best friend. Emili does end up with the hot guy but unfortunately, she also ends up with a hot mess. I searched around for Lance (alias: The Bad Boy) and found the guy below. I have no clue what his real name is, but wow! He’s Lance! Can’t you just imagine the swagger of this guy—he is SO Lance! I haven’t yet found the star to play Farah. (The friend we love to hate.) Farah pops up in subsequent novels in The Edgemont Series, so I still have a bit of time to look. The search was fun. I hope you’ll grab a copy of The Lance Temptation — a new YA release this month from Astraea Press. You can read for yourself the disaster Emili makes of everything. I’d love to hear your thoughts about who should play whom in a movie version. Thanks so much for reading! I hope to hear from you soon. When not writing or teaching, Brenda can be found at her lake cabin with a book in her hand and her dog Lucy on her lap. If you’re looking for good, clean teen reads, check out Brenda’s books! She loves getting to know her readers better, so stop by and say hello at: www.brendamaxfield.com Learn more on Facebook, Twitter, or on her blog. How great does that sound? It could be yours. All you need to do is complete the Rafflecopter form below. Easy peasy! Thanks for the great giveaway! This looks like a great book. I think Robert P. is a good Edward. Brenda, this looks like a really great read! I love your picks, but your cover seems really spot-on, too. Best of luck with your release, and thanks so much for coming by Honestly YA! Thank you so much! I appreciate your best wishes. I love the cover, too. Amanda Mathews did a super job! Hi Brenda! I'm playing catchup as usual. I love the cover of your new book!!!! Like really LOVE it. The design is so fun. And the story sounds great. Thank you, Carey! I was quite pumped when I saw the cover! :-) I appreciate your kind words!